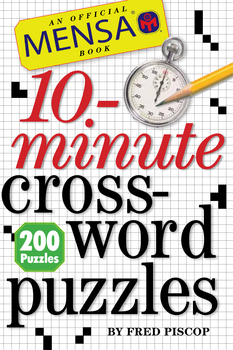 Expertly written by puzzle master Fred Piscop, Mensa member, author of the Mensa calendar, and frequent crossword contributor to both The New York Times and The Washington Post, these cleverly themed crossword puzzles will appeal to both seasoned solvers and novices looking to hone their skills. They are an addictive addition to your morning routine (just add coffee); perfect for evening downtime; just right for your commute on the tube, or while waiting at the doctor’s office or sitting in a restaurant—anytime you need a mental pick-me-up. The book’s chunky format, which works so well for puzzle books like The Original Sudoku series, fits easily into a bag. An answer key is included at the back of the book. It’s puzzle nirvana for crossword lovers who have just a few minutes to spare, but still crave a challenge. Adapted from the popular Mensa 10-Minute Crossword Puzzles Page-A-Day Calendar, Mensa 10-Minute Crossword Puzzles strikes a perfect balance: The puzzles are tough enough to be sanctioned by Mensa, the internationally famous high-IQ society, but are designed to be solvable in ten minutes or less.